A dump, dry, and stuffy room or office which is overly hot can be very uncomfortable to stay in or worse still, work in. Such an environment does not only reduce one’s productivity but also likely to cause a headache, sinus congestion, chapped lips, as well as tampering with a person’s concentration level. However, this is a very common situation, especially during summer, when the temperatures are overly high and the air moisture way too low, or during winter. To provide a perfect and comfortable working environment, humidifying the air of your office or house becomes the best option. The Venta LW45G Humidifier and Airwasher is a good appliance in curbing the situation and providing a cool and serene environment. Here are more details about it. Venta LW45G Humidifier and Airwasher is perfect for a more spacious room of about 800 square feet. It is small in size and has an attractive cube-like design that is beautiful to display giving you no stress of where to place or rather hide it. It has a flat bottom and top and can be placed on top of a table, cabinet or on a small stand without one having to alter the room’s or office’s arrangement to create space for it. Another great thing with the Venta LW45G is that it is a lightweight double use unit which functions both as a filter-free air purifier and an evaporative humidifier. This means that not only does it humidify the air inside the room but also purifies it by eradicating any kind of small size airborne pollutants such as pollen, dust, lint, fur, etc. Venta has used the Cold Evaporation Technology on this Airwasher which inhibits it from producing white dust, as it the case with most humidifiers, thus making it more hygienic. Additionally, it provides the perfect room humidity which ensures the absence of destructive static electricity thus preserving the lifespan and the functionality of electronics such as computers, pianos, speakers, etc. as well as the wooden furniture. It uses water as the filter making it filter-free and it also needs no replacement items a feature that makes its use very simple and easy. Unlike most humidifiers, the Venta LW45G is easy to clean, which can be done at least once a month. As long as the washer is cleaned periodically, gunk build-up is almost impossible and in that case, requires no regular check-up. Additionally, this humidifier is fitted with auto shut-off with an indicator light for water refill when it runs out of the water. The water compartment can hold up to 3 gallons of water which can be used for quite a while before it calls for another refill. The good thing is that Venta has made the refill process very easy which is simply done by lifting the top, adding water, then tightening the lid back in place before turning it on. To take your well-purified, humidified room a notch higher, Venta accompanies their Airwashers with a 3-pack Eucalyptus Fragrance, for that phenomenal smell. It comes in both white and black color and at a favorable price. This high-quality product has a 10-year warranty and has no issue whatsoever when used with either distilled or tap water. Its performance is consistent and reliable while its state of the art German engineering ensures that this does not over humidify the room. I have used Venta for a month. It has made a difference in the quality of the air in my bedroom. I would recommend this air washer. " This is a superb product: it is quiet, efficient and worth every penny. 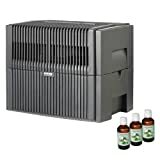 It is better than any other humidifier I ever bought except a different size"
It is no doubt that the Venta LW45G humidifier and Airwasher is an excellent humidifier with limited maintenance and non-complex operation. However, as it is the rule of life, every good thing has its bad side and so is this Venta humidifier. Despite its ease of use and efficiency, some people have complained about its ridiculously high price compared to many other humidifiers available in the market. Others have complained of the strong, not so good scent of the eucalyptus fragrance, which can be switched with another preferred fragrance, while others have complained of this not meeting their preferred humidity setting. However, despite these few complaints, the Venta LW45G humidifier has proved to be way much better than most available humidifiers thus very recommendable to be in your office and sitting room to ensure you are having the best humidity level in the air.